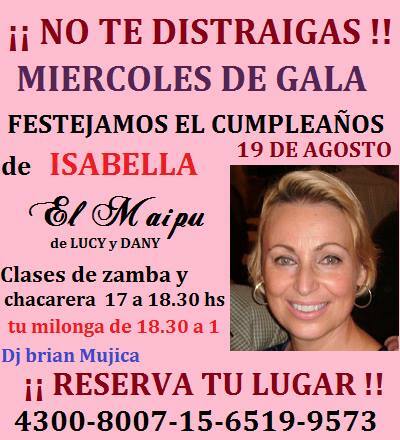 Recently I was incredibly surprised to see my image on the newsfeed in facebook with my picture advertising that there would be a birthday celebration for me at the beloved “el maipu” milonga (tango social dance) here in Buenos Aires. Having invited a few friends, enjoying some local champagne and laughing a lot….the organizer Dany whispered something in my ear like…so we will have a birthday vals for you. I had actually never seen a Birthday vals done in this milonga before so didn’t take it very seriously. Once the announcements were done and my Birthday mentioned, Dany suggested that since I had blown out the candle on the Birthday cake too early (or late)(who can remember with all the champagne) I would have to dance a Birthday vals in front of everybody. Once having stood up a friend of mine danced a little spiral of the vals with me and very quickly someone else cut in and danced a little phrase etc…. etc…it was a lot of unexpected fun and really felt great to have the organizers invite me to do this with all the regulars. This milonga has been a regular place for me for over six years. Thank you to all the regular dancers. A special thanks to Lucy and Dany of “El Maipu” that run a truly generous, friendly milonga (dance) that makes everyone feel ‘at home’. This entry was posted in bailar, Buenos Aires, dance, el Maipu, isabella, joy, la nacional, milongueros, music, tango, tango milonguero, writing and tagged Argentine tango, close embrace tango, Isabella Szymonowicz.